If your child struggles to drift off at night, Let's Go to Sleep is the answer. This beautifully illustrated story is the only book you need for calm, relaxed bedtimes, night after night. Let's Go to Sleep is specially designed to soothe your child to sleep, helping them wind down and relax at the end of the day. 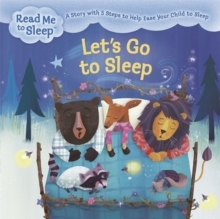 Including five simple and effective steps to help ease your child to sleep, this lulling story features techniques and prompts that effortlessly encourage both reader and listener to breathe deep and dream.